Thread by @alexandraerin: "Good morning, babies! Welcome to another installment of Lightly Edited For Clarity, where I'm going to take a deep dive into Donald Trump's […]"
Every one of his pieces ended with the same punchline: a note that the piece originally ran in the Butternut Gazette "...and has been edited for clarity." 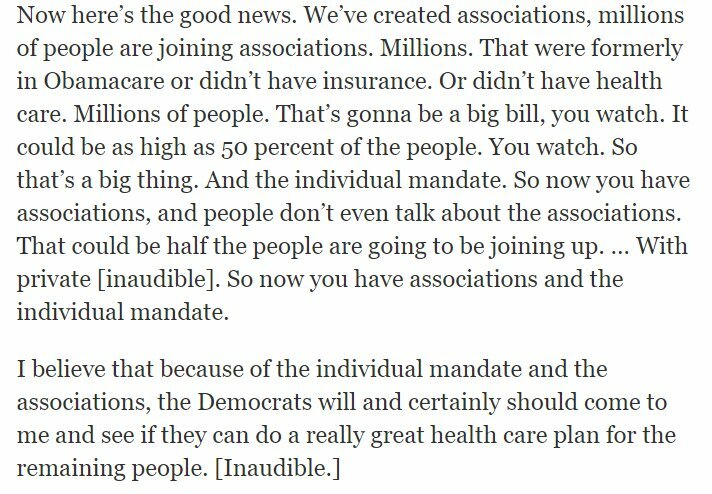 When Trump gives an interview to a print venue these days, the thing they do is mine what he says for multiple articles, then put up the transcript of the actual interview without comment, except at the top where they invariably note it has been "lightly edited for clarity". The gag is the same as it was in The Onion: this mess is the "after" photo. This is what it looks like when they clean it up and stretch things as far as they can without misquoting him, to try to create a coherent narrative out of things. Now, a little more preamble before we get to the amble: Trump, by and large, *does not grant print interviews*. Certainly not with "liberal rags". And his press office and handlers certainly don't sign him up for them. Buuuut what does happen is, reporters happen to be sitting down with him, and they start asking him questions, and he's happy to be flattered and paid attention to, and so they ask: hey, that's good. Do you mind if I quote you on this? And can I record you? 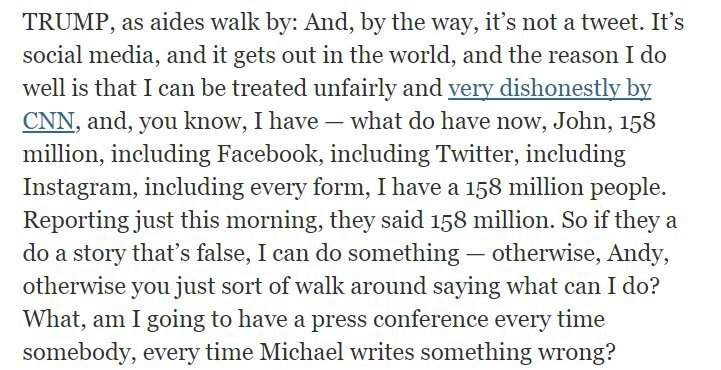 Trump famously trusts no one, and he trusts reporters less than that, but he's never suspicious of people wanting to pay attention to him (something's wrong if they don't), and he's the walking embodiment of Wilde's observation about the only worse thing than being talked about. And that's *not* being talked about, to the point that he will self-sabotage if he has a couple of good days in a row and the news isn't paying enough attention to him. According to the foreword on this sit-down, it happened at his club without *any* aides around, meaning Hope Hicks wasn't sitting by his side, elbowing him or steering him or stepping in to insist things be redacted from the record. In my previous write-ups, I've noted when Hicks steps in, in ways that wind up on the record. And her attempts to evade it, by *writing* her contributions as notes to her boss, so they won't be on the transcript. Sooo in theory this was Trump at his least guarded. He's in one of his clubs, no aides hanging over him, with someone he regards as appropriately friendly. And it is, as I mentioned this morning, a mess. I was just thinking yesterday that the longer he goes inside the bubble, the worse he's going to be. More incoherent. Worse at explaining himself. A human being in peak mental and physical form doesn't remain that way long in isolation. Trump is not isolated in an absolute sense but he is shielded from interactions with anyone who can really question him, who does not share his goals (mingled with the overarching goal of pleasing/managing him). So perhaps it is inevitable that each and every one of these things should be a bigger mess than the previous one. The words Trump uses to describe Sessions' recusal are always interesting. Previously, "very unfair", and now "terrible". A more normal criticism might be "unnecessary" or "the wrong decision" or "it appears prejudicial". ...until you realize that he's judging Sessions's actions (along with everything else) purely in terms of their impact on him. And he's not even talking about hypothetical external effects, but just the abstract idea that he's been betrayed by someone he put in power. The worst betrayal that Donald Trump can imagine is that he gave someone power, and this person refuses to nakedly exercise that power on his behalf. That's disloyal. Very unfair. Terrible. What did he appoint him Attorney General for, if not to reap the direct benefit? You can see this thought process at work, as he labels it "unnecessary" by virtue of the fact that it's "all worked out" anyway. He doesn't pretend to be concerned for the process, the principles, or even the optics. He only cares what the net result is, for him. His repeated assertion that "every Democrat" says "there's no collusion" is something I've gotten into before. 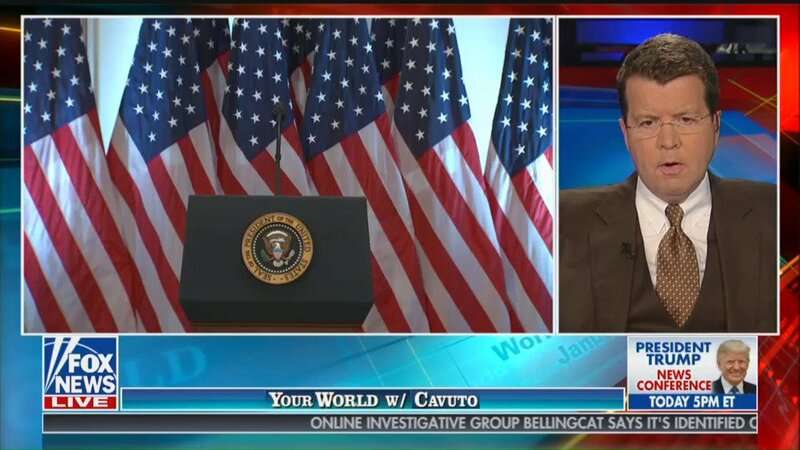 Reporters ask the Democrats on the investigations, "Is there any collusion?" and they say, "Well, we haven't seen evidence of that yet." It's a word game, but unguarded answers like this reveal that it's not one he knows he's playing. He's in full-on Bad Boss mode, clinging to some out of context words that he thinks makes him right, because that's the talisman he uses to protect himself from what he doesn't want. There are, on the other hands, games that he knows are being played, but he sees no reason to hide them. Because what he knows is What Is Known, and if everyone knows it, there's no sense not talking openly about it. Take the middle parts of this paragraph, for example. Lot of reporting since this story dropped last night has focused on what this reveals about Trump's attitudes towards the Congressional investigation and Mueller probes. The takeaway seems to be that he welcomes them, because they help him fire up the base. I'd caution against that level of simplification. People are complex. We contain multitudes. Horrible people contain horrible multitudes. Even the simplest man on the planet (who might, in fact, be Donald Trump) has still got more than one thing going on at any given moment. It is entirely possible for Trump to relish the way that the fire being turned against him helps refine the support of his base and still hate and resent the fire. The fact that he can use Mueller to rally his base isn't going to protect Mueller. He'll use *whatever* to do that. Trump is not a master strategist so much as he is an omnivorous opportunist. If there was no Mueller and no Congressional committees investigating him, he would be making someone else out to be the scapegoat and bogeyman in order to gin up this kind of support. 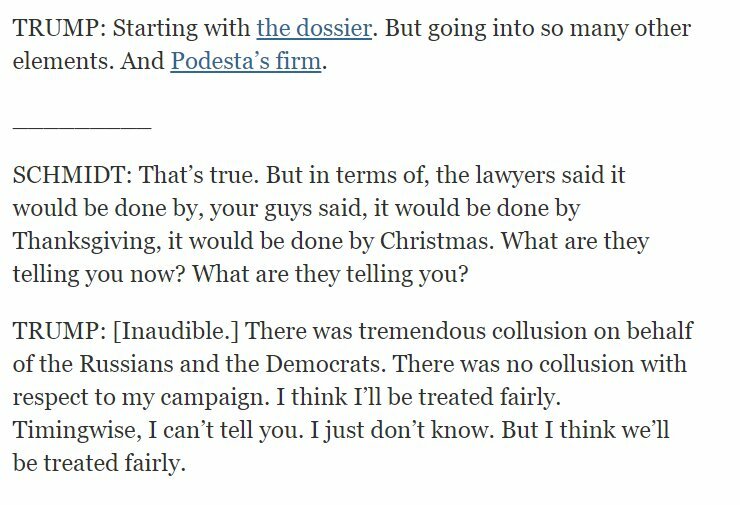 Trump uses the word "fairly" in how he expects to be treated by Mueller. 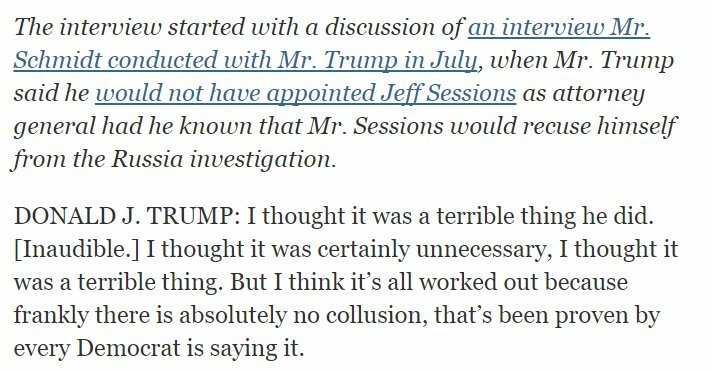 If you want to know what he means by that, just consider that he says it's "unfair" of Sessions not to protect him, that he says it's "unfair" when the media accurately reports on him. What is, so far, is his lawyers. The new ones. You have to understand, Trump's legal team, the ones who came on board specifically to defend him in these investigations, have very little to lose. They weren't involved in the crimes. There's a high bar for dragging them down for defending him. If they win, they're set for life. If they lose, they performed their profession in the most visible way possible and lost a case that most would agree any lawyer would be hard-pressed to have won. You don't really lose defending high-profile clients. But they would much rather win than lose, and if they lose, they would much rather lose *ambiguously*, with a lot of billable hours, a long period of time as Personal Legal Counsels To The President, and maybe a gentle escape ramp rather than a crash and burn. So *they* are counseling their client and his handlers for patience and temperance, advising them to cooperate with the probes, to not attack Mueller, etc. Telling him it is in his best interest to cooperate and seek speedy exoneration. And Trump asks them, "Can I really expect him to be fair? ", meaning *loyal*, and they answer "Yes, absolutely. You can count on him to be fair. ", meaning *fair*. They say "It's in your best interest. ", and he hears "This means he'll clear me." He closes that segment by saying that "everybody knows" there's no collusion. Because what he knows is what everybody knows. Does this mean he believes there's no collusion? He believes it doesn't count if you're not caught "fairly". And he believes he's never caught fairly. I've talked about this before. "Looking like a kid caught with a hand in the cookie jar" is an expression for someone with a guilty expression. Trump is the other kind of kid, the kid who got away clean. That is to say, he emptied the cookie jar at a time when he was the only one home. But no one saw him do it. And you can't prove that someone else didn't break into the kitchen. You can't prove *you* didn't eat the cookies, or that you even made them. And the fact that you would even dream of accusing him, much less punishing him, for something like that... why, it makes him angrier than a false accusation would. Because by rights, by his notion of fairness, he *should* get away with it. He knows what he did, but he *knows* even more strongly that everyone does it, or would do it if they thought they could get away with it, and that he thought he could get away with it, and the only reason he can't is that people won't let him. The horizontal line here indicates a cut in the transcript. They're still talking on the same subject, so it might have mainly been background noise that made the recording incomprehensible (that shows up in Trump's reply). Evidently Schmidt asked about Manafort, though. I point this out partly in the reporter's defense, as people have critiziced him for not asking follow-up questions. But I *believe* he responded to Trump's assertions of no collusion with "Well, what about Paul Manafort?" Trump pointing out how many other Republicans that Manafort has worked for and for how long is another sign of his rather juvenile concept of how any of this works. "I'm in trouble for hiring Manafort? He barely worked for me." As if the question is not *what he accomplished*. The bit about Diane Feinstein is interesting. I know time is an illusion and 2017 doubly so, but I *believe* he's talking about something she said at the start of November, almost two months ago. "The other day." He clings to this, possibly rewatches it, definitely relives it. Feinstein is not actually the head of a committee. The party in power chooses the committee heads. She is the ranking Democrat member of the Senate Judiciary Committee. I keep circling back in my head to the moment, early in Trump's reign, when he announced "We caught the press in a beauty." ("beauty of a lie"; c.f. "whopper") over the inauguration crowd size. Like, that's the most sincere he's ever been. Announcing he'd caught the press lying. He was so happy, so pleased with himself, so sadistically sure that the press would be roundly pilloried and then grovel for forgiveness and then, then he would get what he thought was due, which is the treatment he imagined President Obama got. Because the corollary to What Trump Knows Is What Is Known is What Trump Believes Is What Is Believed. I think about that "We caught them in a beauty." 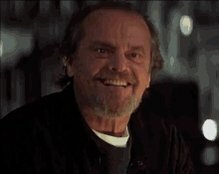 moment every time Trump starts waving around the idea that the Steele dossier somehow shows Democrats colluded with Russia to skew the election. 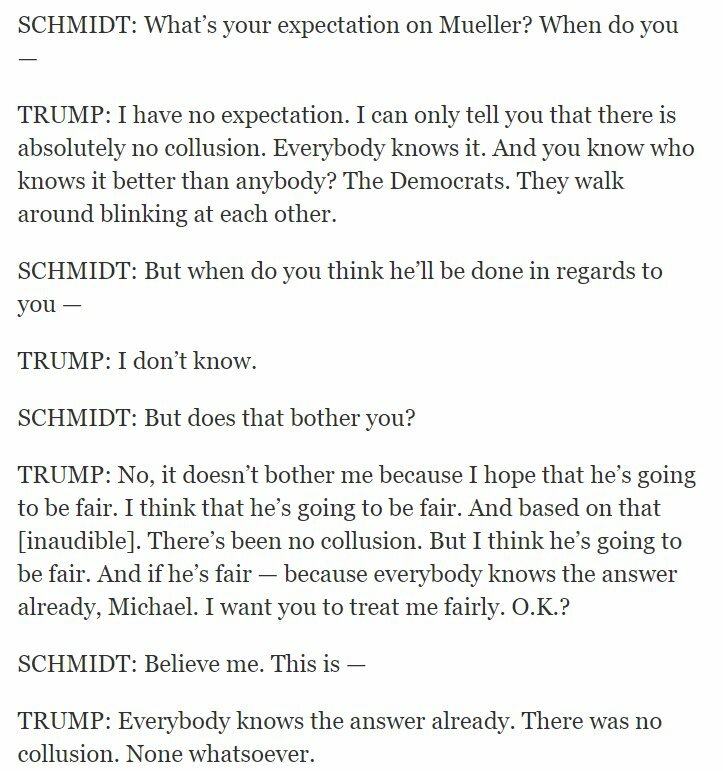 There's another cut in the transcript, so we don't know if Schmidt asked a follow-up on that, asked him to explain what evidence of collusion he saw. We don't know what he's agreeing is true here. I kind of think he might have taken a stab at it? And the "That's true." is him conceding something that is factually true, even if it doesn't support the point that Trump thinks it does, and moving on. Their assurances of "fairness" and the way Trump understands that have kept Mueller safe so far but they have exhausted the ability to keep him hanging on with a promise of an end point, and this is the reason Mueller's job is not safe in any absolute or long-term sense. He has clearly been coached to talk about things in terms of how they affect the country rather than himself, but notice how he's using "the country" as a stand in for "me". Sub "me" in for "the country" in this whole paragraph and it reads much more naturally. He does this very fluidly compared to a lot of his coached mannerisms, because he already sees himself as synonymous with the country. When he talks about deals making us look bad, or the USPS looking "dumb", he only cares because they reflect on him as Country Boss. It is *very* clear that he has no idea what these cases are about, and doesn't feel like he needs to know anything about them to make decisions or dictates about what should happen as a result of them. "All the stuff with the... and whatever happened to the Pakistani guy?" You can read the links on the NYT article for context but it's abundantly clear that Trump himself did not have this context in mind when he was saying this. It's just a load of Stuff, Bad Stuff about other people, about his enemies and critics. There is some low-key snark from the Times in the form of linking to their own reporting on the subjects he raises, in a transcript where he is trying to imply that they will ignore them, being "real stories". That's what he's trying to imply with that somewhat elliptical sentence in the middle. I probably don't have to tell you but Trump's wildly incoherent throughout this. If I hadn't been reading his interviews for almost a year now, I don't think I could make heads or tails of it. 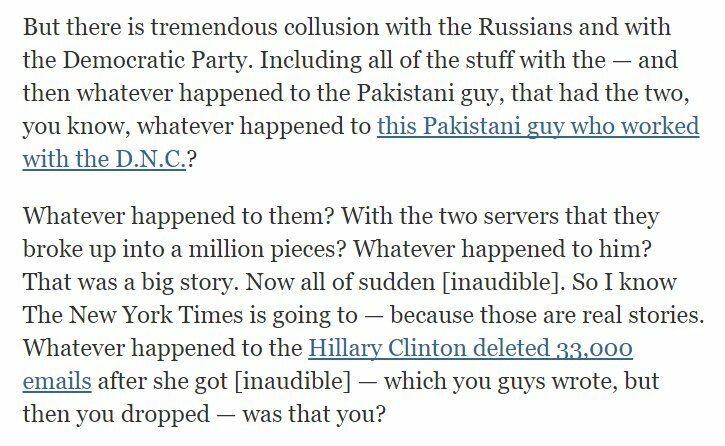 The idea that the NYT in particular or any mainstream press *dropped* the e-mail story rightly strikes us as ludicrous, but it's how Trump's mind works. He deserves everything, his enemies deserve nothing. The fact that the NYT hasn't literally hounded Clinton to death is bias. 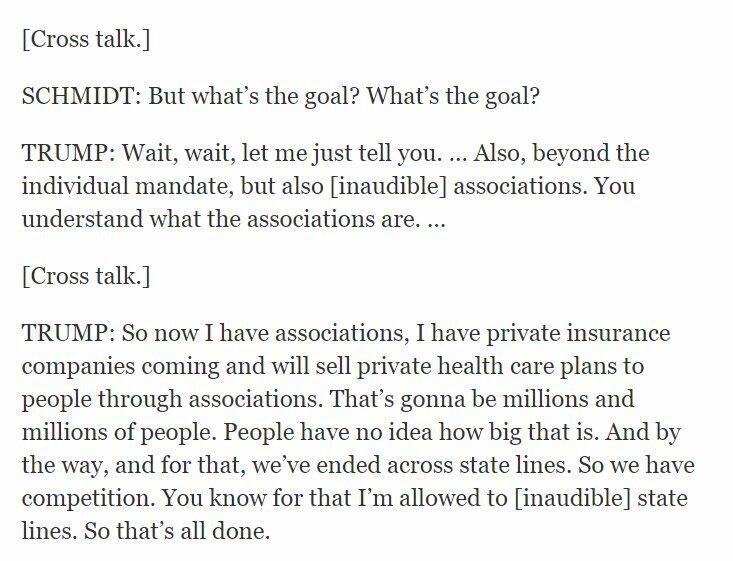 Interesting to me that the transcript includes Trump asking the reporter he's talking to "Was that you? [Did you kill the email story?]" then jumps over his answer or deflection. 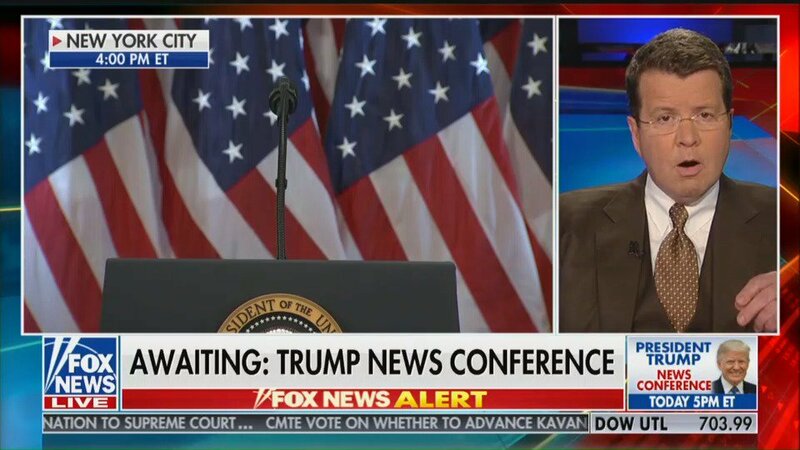 Worth pointing out again: Trump does not know he's being interviewed. As far as Trump knows, he's just talking to a business friend, a colleague who works in the same industry as he does (Trump sees himself as a media figure) and who is being flattering and reasonably pleasant to him, and who finds him very interesting and quotable. I think if Hicks had been present for that interaction, she would have insisted it be considered off-the-record banter. But its presence reveals a bit about why Trump keeps sitting down with people from "the failing New York Times". He sees it as an opportunity to dig back. He asserts he has absolute right to do whatever he wishes, because reassuring him that he has that is part of managing him. The other part is explaining to him why, genius that he is, he doesn't want to do it. 1. Everyone has agreed there's no evidence of collusion. 2. We can expect Robert Mueller to be fair. 3. It's in your best interest to cooperate. So he takes away that OF Course he can fire anybody and everybody, but he won't, because *hopefully* everyone will be "fair "(loyal). 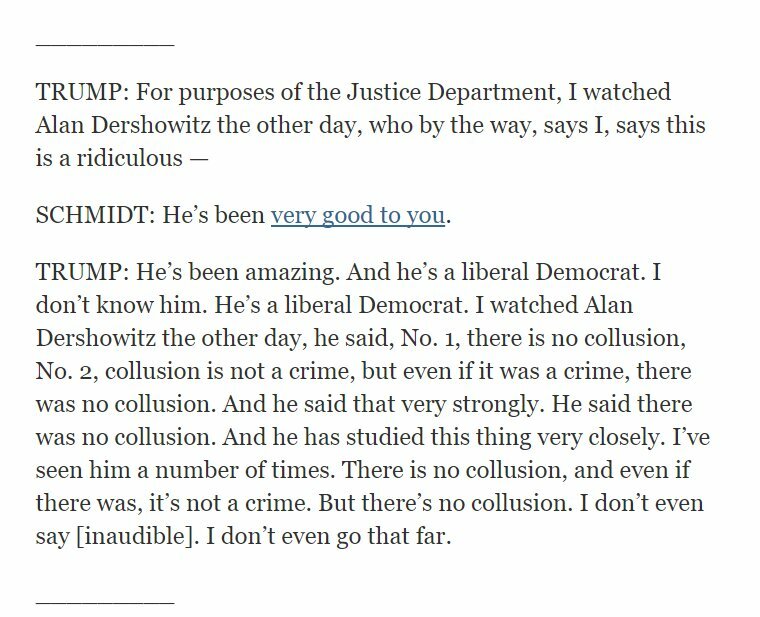 I know Alan Dershowitz does go on TV a lot, but I still kind of wonder if Trump distinguishes between watching the same clip multiple times and seeing someone actually say a thing multiple times. REALLY interesting interaction here, regarding Trump's lack of imagination. When he says the Russia story is an excuse for losing, he can't even imagine it being anything bigger. Any ongoing impact on his so-called presidency is an accident. He says the people who pushed the Russia story can't believe it became a story. Because *he* can't believe it. He thinks it's an excuse for losing, because that's what *he* would look for in their shoes. And Schmidt is trying to put the idea of the ruse, the excuse, into the context of an ongoing political power struggle, but Trump rejects that! Because if he had lost, he wouldn't have been thinking ahead when he made his excuse. He'd be trying to erase the loss as a loss. 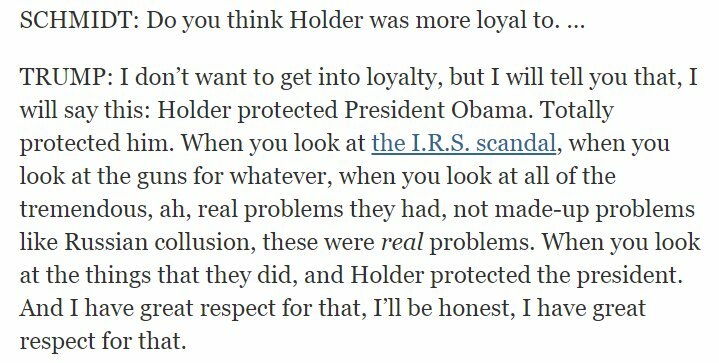 "I don't want to get into loyalty"... because he has been in trouble for talking about loyalty, asking for loyalty. Again, it's very clear that he doesn't understand the "tremendous, real problems" he's describing. That's going to become the major theme here. 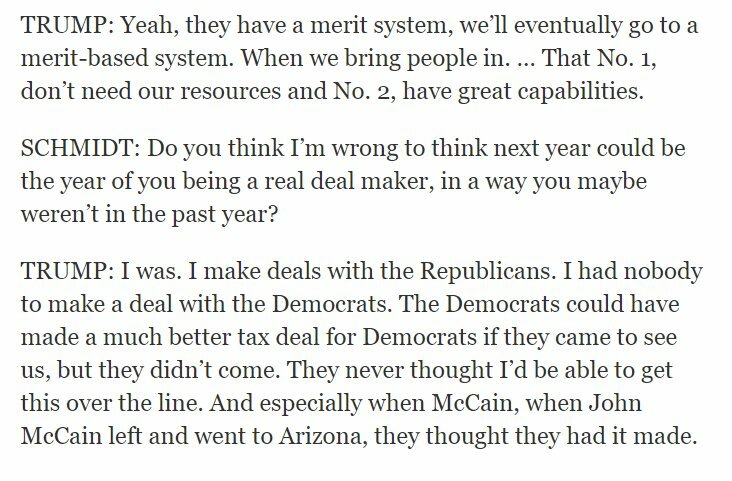 Here's what Trump says when Schmidt asks him to "explain taxes", explain how they came up with the tax bill that just passed. The idea of "doing bipartisan" I'm pretty sure I saw come up more than once in my read-through of the transcript. Everything is a buzzword to Trump but it's increasingly clear that he really doesn't understand these words or how they're even used enough to fake it anymore. 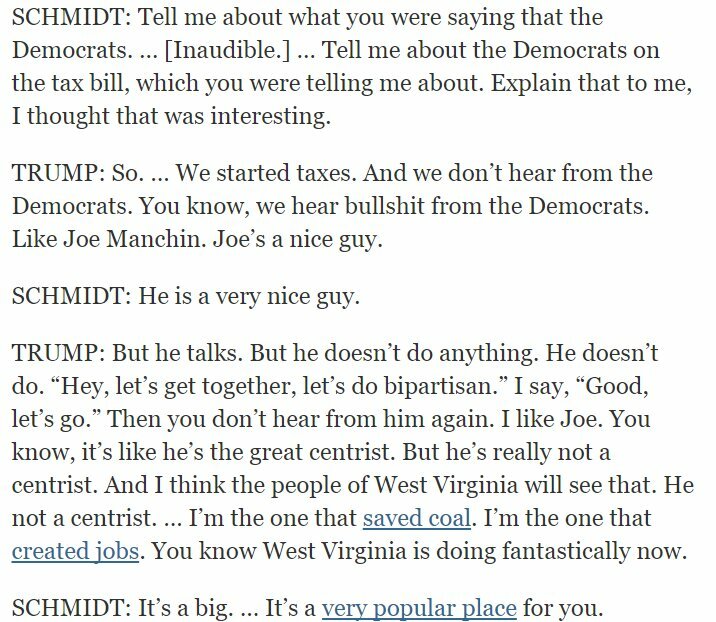 And you can see how his ability to work even with an opportunist like Joe Manchin is hampered by his inability to share credit. The idea that a Senator from West Virginia might share in the credit for any job growth or coal resurgence, real or imagined, is unthinkable. Last time Trump made this comparison, he said that WV's GDP gains were the highest after any other state but Texas, "which is second". Meaning either he thought they were the highest after the second highest, or he thought we needed the term "second" defined for us. We don't have the whole paragraph but it's clear he's free associating, between a southerly state he won by a wide margin, to Alabama, to the GOP's loss there and what it portends for 2018, and how that's not his fault. I think it's pretty well-established that Trump would have preferred to endorse Miller and Bannon's pick, Moore, but was talked into endorsing Strange for the reason given here: he had a better chance of winning. Also note the part he repeats, about being head of the party? Trump does not naturally think of himself as the head of the Republican Party because he does not naturally think of himself as part of it, or it part of him. This is more of the reasoning that Priebus and McConnell fed him about his need to weigh in on Strange's behalf. But even if it wasn't for his own reasons, he *did* endorse Strange, and he's taking credit for Strange shooting up in the polls while taking no blame for Strange losing the primary, or Moore losing the election *after Trump directly campaigned for him* in Pensacola. Note also the wording for what would have happened, he thinks, if Strange had won the primary: "There wouldn't have been an election." A bit hyperbole but also a little literal. He thinks there would have been so little doubt, it would have been in the bag. Why bother voting? "I hope you can straighten that out." Again, Trump is not seeing this as an interview. He's giving a friendly and receptive NYT representative a piece of his mind to set the record straight. This is friendly feedback for someone who maybe recognized he needs it. "I hope you can straighten that out, I wish you would cover this." 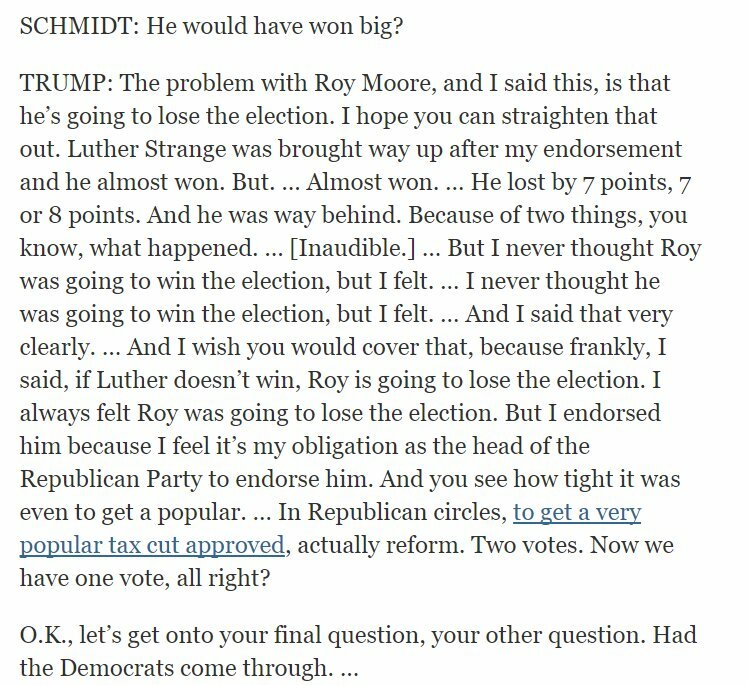 Also note the way Trump skips over Roy Moore's sexual predation as just being some part of an unspecified "two things that happened" to cost him the election. Also note his description of the tax cut as "very popular". It's possible this is a vestige of the bubble he lives in, where everybody he talks to or listens to likes it. But more likely it's just an old tic, where any positive or negative descriptor is just branding to him. It would be entirely consistent with Trump's character to honestly wonder why everyone hates a bill that's so popular. He's not sure if bipartisan is a noun or an adjective or what. And I don't mean this in a "hyuck, hyuck, he don't grammar good, do he?" sense. You don't have to know the phrase "indefinite article" to know if a word takes an "a" in front of it or not. And even if you're wrong about how a word is used (as happens to all of us), you would usually be consistently wrong about it over the course of a single short answer. 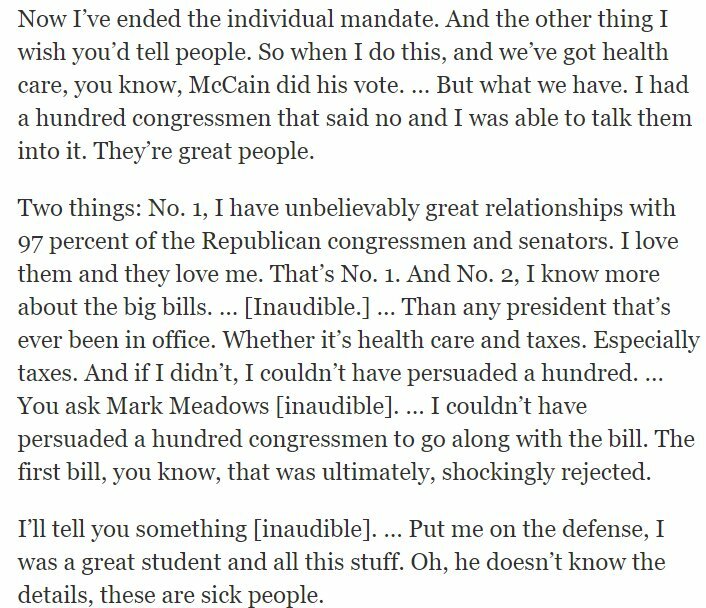 Trump has always been careless about words and meanings and usage, but he's getting more so, and the longer he sits and talks to the same person in this interview, the more apparent it becomes. He thinks he's being very canny, very savvy, revealing that in his mind certain provisions of the tax bill *were* essentially revenge on New York for consistently going against him, refusing to honor him or work with him. For Republicans to compare themselves to Reagan is nothing new. It'll be interesting to see how Trump's fresh angle of "Man, that guy sucked, didn't he? Couldn't seal the deal like me." plays out. My prediction is that Trump fans will continue to like Trump. Trump's notion is that since the individual mandate is the least popular part of the ACA (true enough), by some transitive property its repeal being embedded in the tax bill will make people accept the tax bill as popular. Because it's not about numbers. It's about labeling. Every new Trump print interview seems to top the previous ones in terms of "It's one banana, Michael. How much could it cost? "-level economics. Here we have a road or highway coming in at $12. Or, you know. The same as a year of health insurance. Okay, so we are back. 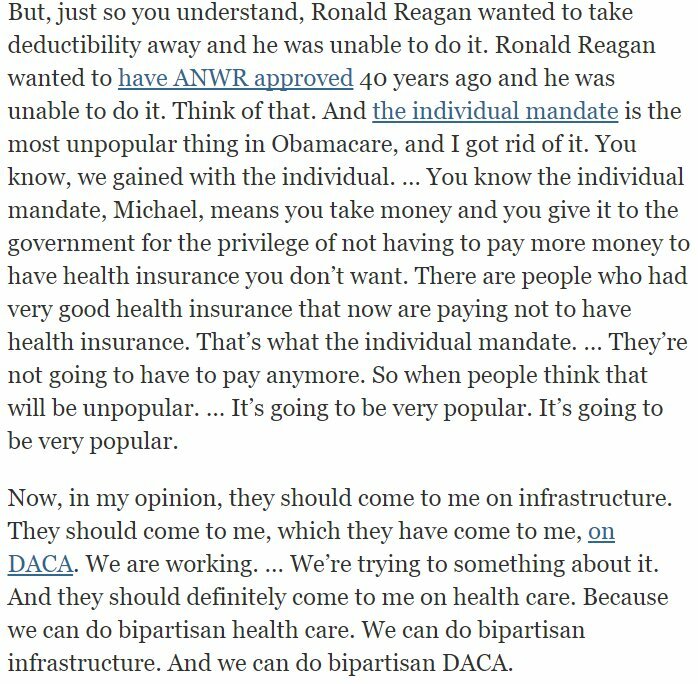 And as we get into the second half of the interview, it must be said that more and more as it goes on, it's about policy specifics. Which is to say it is completely incoherent. There has been a lot of pushback against the NYT for their reporter not following up or asking any probing questions when Trump makes sweeping declarations and bizarre pronouncements, and the NYT's response is basically, "Look, we got the interview, didn't we?" 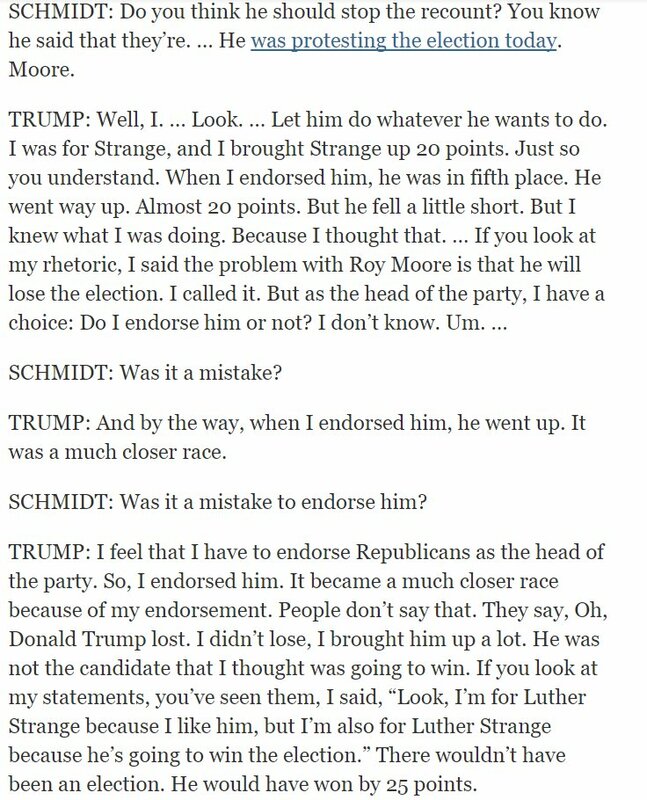 Throughout the first half I have been pointing out where Schmidt did appear to be asking follow-up questions and holding Trump to a thread, and also where it becomes apparent Trump is unguarded and not seeing this as an interview per se, to support my take. Maggie Sunshine et al have been responding with "If we get hostile every time he sits down with us, he won't sit down with us anymore." All they have to say is, "That's interesting, tell me more." If someone is talking about something they don't have the first clue about and doesn't want to admit it even to themselves, "I don't follow, could you break that down for me?" will not register as an attack. 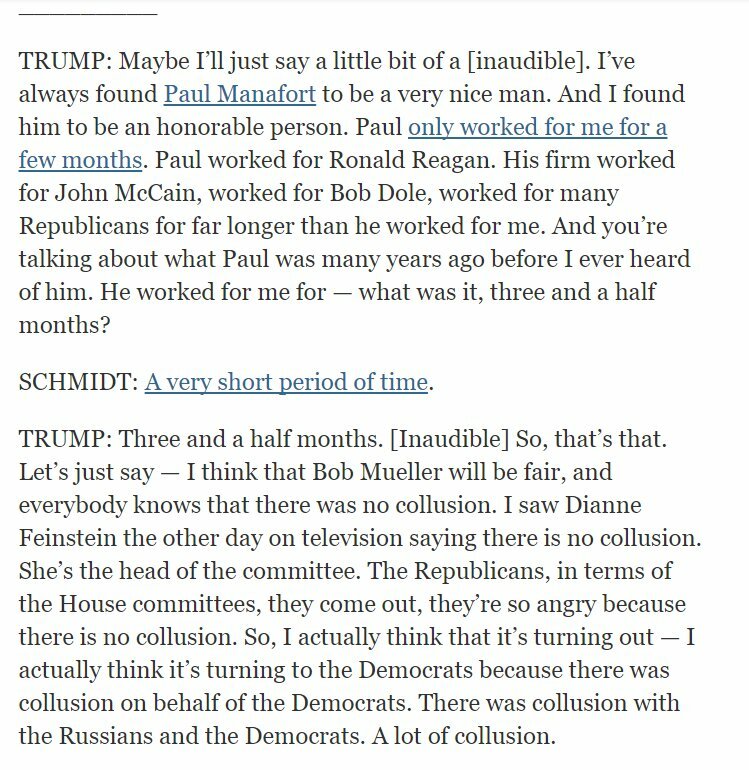 Unless it's done clumsily, but Schmidt and Haberman and that whole crew are capable of socially engineering these interviews *with a man who refuses to be interviewed*. Anyway. The actual interview itself. 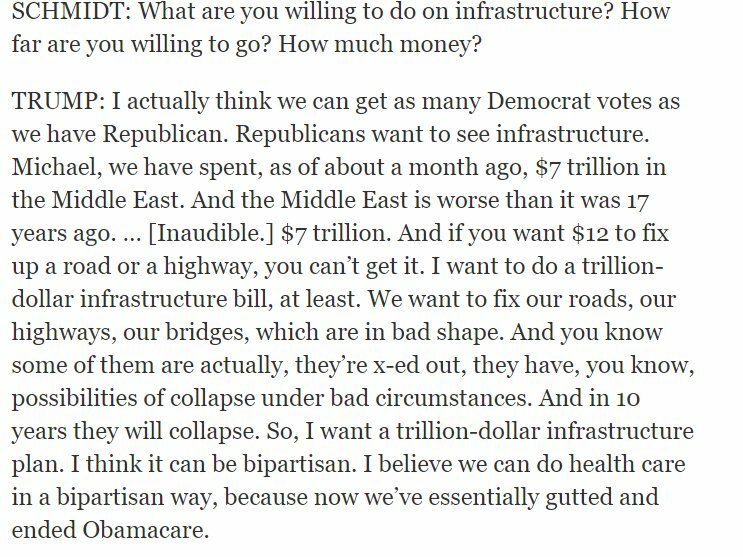 Schmidt's question to Trump is "what's the goal" on infrastructure, or perhaps more broadly on bipartisan cooperation. Notice that Trump has no idea how to answer this question. So he's talking about health care, and he has no idea there. "We've ended across state lines." He doesn't know what these associations as he calls them are or who created them. He knows there's something about "Across State Lines" but he can't remember if it's good or bad in his version (supposed to be good). According to the GOP mythology, "selling health insurance across state lines" is a market cure-all. They actually mean letting companies choose which state's regulations to follow so they can all sell insurance from Delaware or North Dakota, ignoring state regs in CA or wherever. But here Trump is taking credit for "ending 'across state lines'." Now, I don't actually like pedants or grammar prescriptivists and I don't like class snobbery over how people talk so I want to emphasize this is not just He's Talking Wrong. He says things like, "It's called Make America Great Again." or "We ended across state lines. ", where he's treating an entire phrase as a word, as a particle, and I point it out because I think it shows the extent to which he is just not even processing what he's saying as words. And there's more than one thing contributing to that, I'm sure, including a lifetime of believing words have no meaning and truth has no value, and relying on sales patter instead of making points. Old dogs don't learn new tricks, but the old tricks pile up. They get backed up. 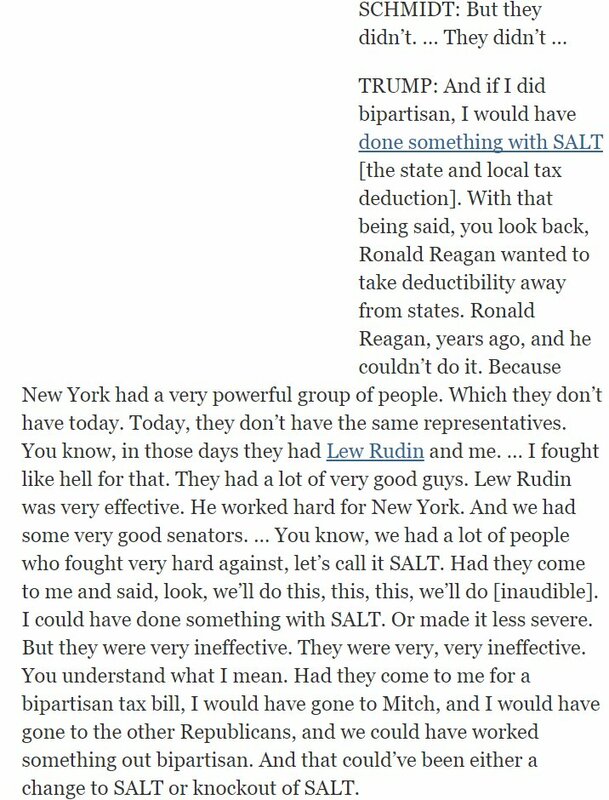 And to a tremendous extent, in the second half of this interview, a lot of times he's just talking, just saying things, and while I think transcribing that is a valuable service for letting us see what's happening with him, I question the value of *only* transcribing them. He goes on, and if you look here again he's giving the reporter *marching orders*. Feedback on how he should be reporting on things. 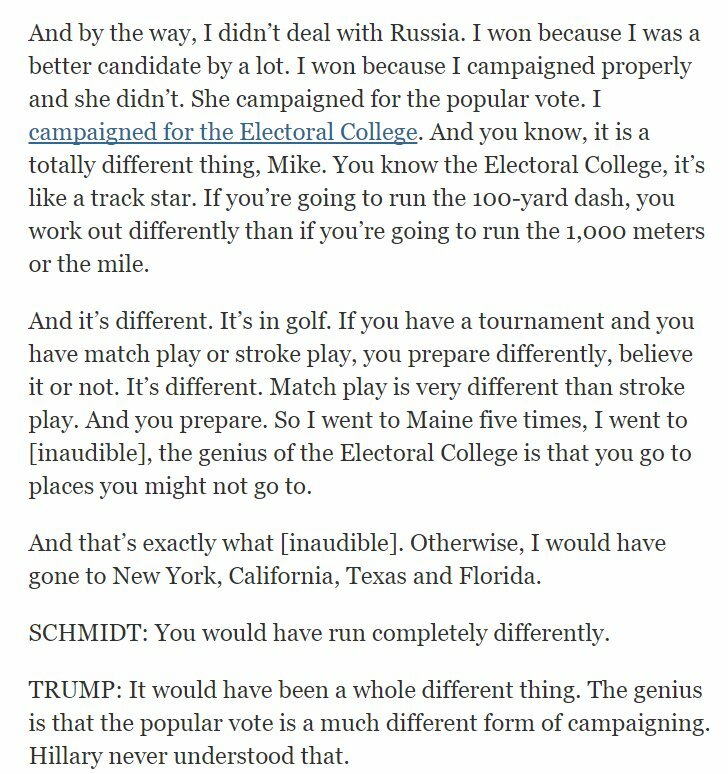 Which again is why I think there was a lot of latitude where Schmidt could have pressed him for more detail, more specificity. He's telling Schmidt he wants him, Michael Schmidt, to report in the New York Times that he, Donald Trump, has the best relationship with the GOP Congress and knows the most about big bills and taxes. At that point, it's kind of incumbent on Schmidt to push back, I'd think? Anyway. Breaking down what he's saying here, he's claiming he must know more about bills than any other president, or how could he have gotten so many yes votes on a bill that didn't pass? As though every bill that passed didn't get *more*. Remember when the White House announced that 48 yes votes in the Senate was good by any measure? That argument came from the top, from a man who has no historical perspective but believes everything he does or that happens to him is unprecedented, groundbreaking, earth shaking. If it's not clear, the "sick people" are the people who say he doesn't know the details of the tax plan or the healthcare bills. It's sick of them to question what he "knows" to be true, because if he knows it, it is known, and if it is known, then it's sick to pretend otherwise. Speaking of "What Donald Trump Knows"... he just, *just* discovered or had explained to him what writing something off as an expense means, which means it's brand new information to him. I'm sure he was broadly familiar with the concept but just now learned it's not just a dodge. And while there are certainly changes to how deductions work in the tax bill, it's apparent he believes that expensing an item is a brand new idea that is going to change how businesses do business. The *specific* change he's clumsily referencing is the ability to deduct long-lasting equipment all at once instead of spreading it out over five years (which is based on the idea that the equipment will likely be used for more than one year). But to hear Trump tell it, no one has been expensing their office equipment this whole time. No one even had the idea. His claim that it will be "far bigger than anyone imagines"... is based on nothing. That's his standard claim. He once re-wrote a joke about his imaginary orbital space station to make it bigger, in a roast where he had veto power over the jokes. If you watch Trump's comments on anything, he *always* says "I think it'll be bigger." Why not? It costs him nothing to say. Even more so than the Alabama primary/general elections, this is the clearest example of Trump's policy of "I get credit for the good but no blame for the bad" you could hope for. He's responsible for everybody who voted for the healthcare bills, but not their failures. We are more than halfway through the interview, and the further we get, the less of substance there is, to be honest. Which is another reason to take exception to the idea that we would have lost something if Schmidt had pressed him on this. But I still maintain that he could have probed without it being read as hostile. "People say Paul Ryan is a policy expert. Would you say you know better than him?" "You know the tax code better than any CPA. Could you explain more about that one year expensing?" He certainly could have asked him about these associations he's taking credit for having created, and the millions of people he says are already joining them. Trump does not see talking about his (imaginary) accomplishments as an attack! 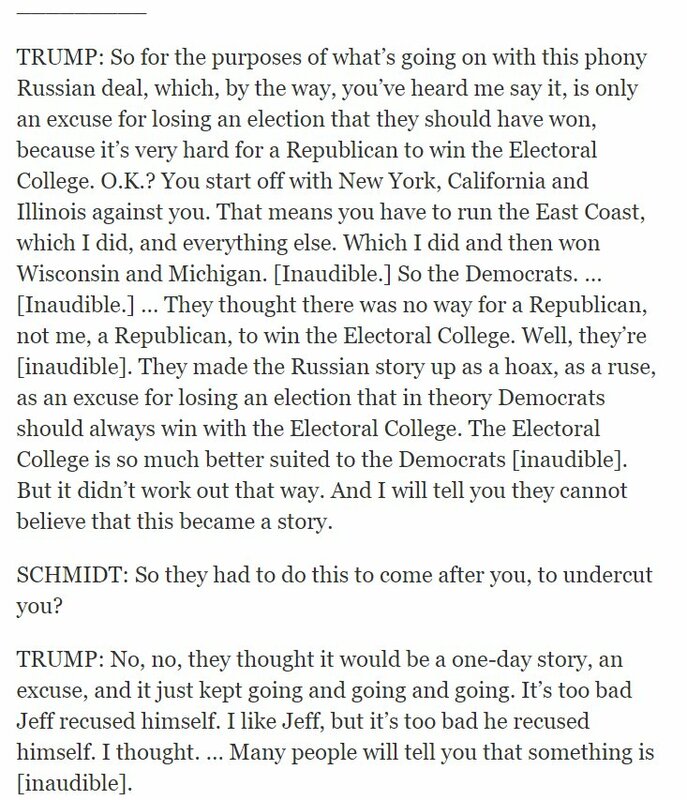 The other thing is, even when Schmidt is trying to hand him a lifeline, help him find a way to make the things he's saying make sense (as above, when he was talking about the Russia story undercutting him), Trump rejects it. No credit for trying to help Trump. "I don't think I'm changing." This is important to Trump's self-image and to his base. They were justify and rationalize any change, flip-flop, or reversal he makes, but part of that rationalization is the idea that he is a rock. Unchanging. Strong. Certain. Trump does not understand taxes or health care or policy in general, but he does understand that the center is MADE OF LAVA and that change is for beta male cucks. So Schmidt again tries to hand him a lifeline! Tries to help him find his way out of the quicksand to the edge, where there might be something to hold onto, if not stand on. And Trump rejects it. Because what is he supposed to do, agree with a man? He's not gay! Schmidt is reframing Trump's garbage from the cricket bats it is comprised of and putting it in terms of Trump's personal mythology as the dealmaker, The Great Negotiator, and Trump swats the attempt away to say something even more snack baskets. "I'm moving in both directions." 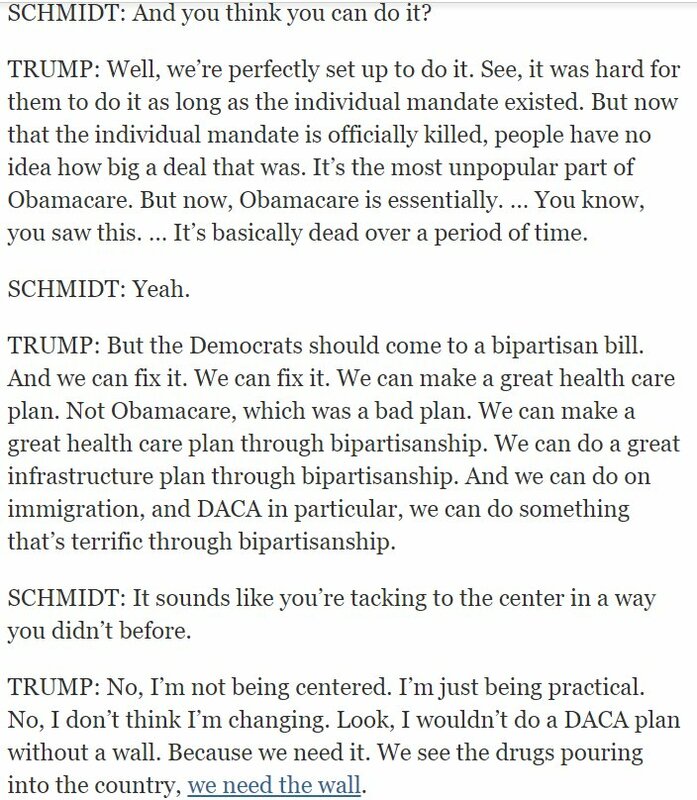 I just want to point out that the weirder Trump gets, the more helpful Schmidt becomes. Early on in the sit-down when Trump was closer to cogent, Schmidt was more pointed. But when his interview subject gets lost, Schmidt's instinct is to help him. And this is not necessarily a terrible trait for an interviewer! If you're doing a human interest puff piece and talking to an instant celebrity or hero of the day who's not used to lights and recorders, sure! Help them find the narrative thread! Present them in a good light. And he doesn't appreciate the help. "the chainlike migration, we have to get rid of the chain. The chain is the last guy that killed..."
Great place to ask: "Mr. President, I think a lot of people don't understand what chain migration is. Could you help us out?" Again, Schmidt is trying to help Trump here, but Trump doesn't have the ability accept it. He's being handed a fluff question, a rebuttal to the criticisms of his first year, positioning it as building towards a second one. He's offended by the idea he has any improving to do. 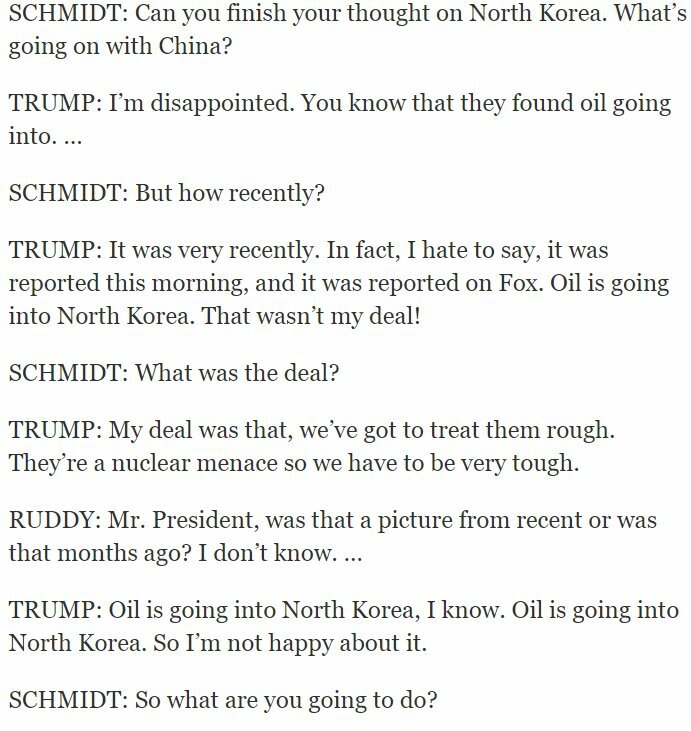 Of course, when Schmidt asks Trump to explain something, he doesn't exactly get an explanation. But the answers are still instructive. He likes China because he likes President Xi because President Xi flattered him. This is the tweet, for reference. 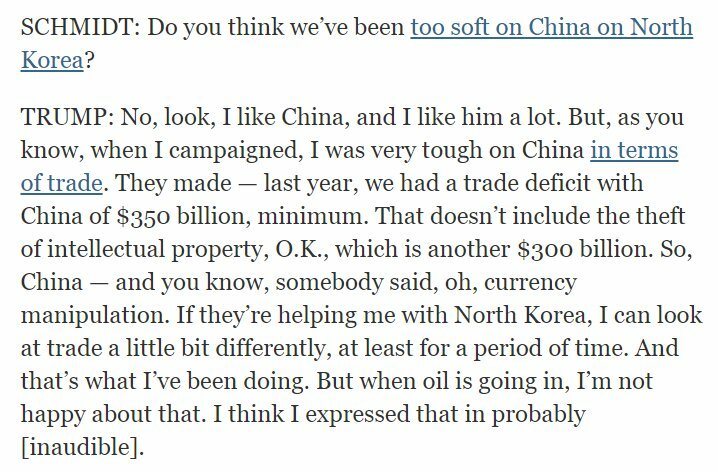 But anyway, Trump is making some very specific and yet over-the-top claims about how China treated him, and I am astounded he was not asked to elaborate on that. Because to me, it sounds like. It kind of sounds like he's talking about bribery? Either actual out-and-out bribery or the absolute schmuck's alternative to it, where because they treated him like a king for two days they can do whatever they want and he'll do nothing more than posture about it on Twitter. 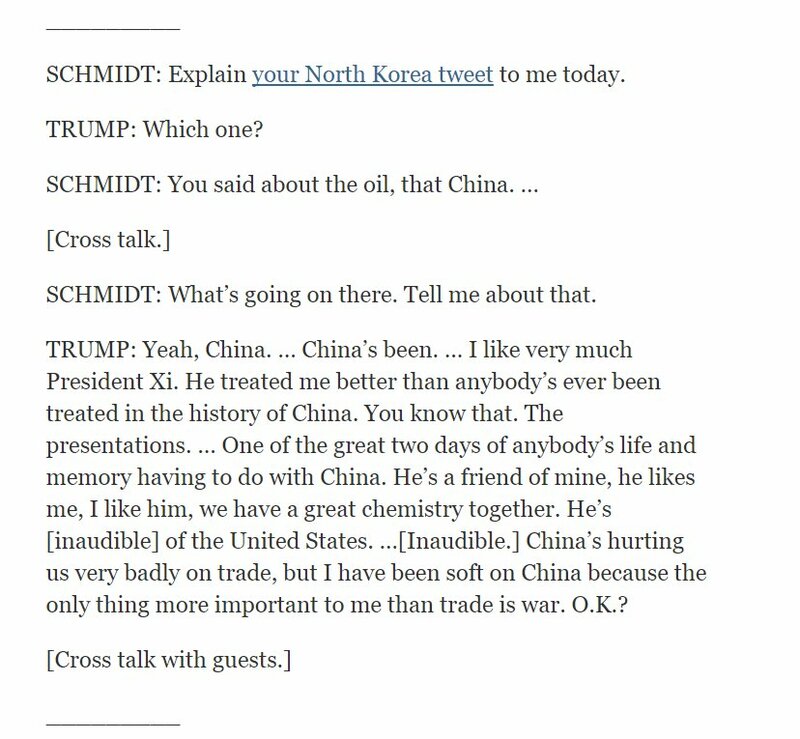 To give Schmidt credit where it is absolutely due, he does not let go of this immediately but tries to follow up and, I think, succeeds in making it clear that Trump *does not know* what is going on, only what he remembers seeing on the news. It would be very appropriate for the NYT editorial board to put out a piece today talking about how very alarming it is that our so-called president learns about world events from the news instead of his briefings, and even then he doesn't quite remember what he heard or saw. There was an early 20th century comedian, Will Rogers, whose most famous joke to this day was "Well, all I know is what I read in the papers." His own formulation of the Socratic maxim about the only true knowledge. And that's what's steering our ship of state right now. Trump's ignorance is both dangerous and deliberate. It's like his habit of lying about something that is plainly otherwise (claiming he's going back to work on his way to the golf course, saying his reproduction painting is an original, etc. ), part of his authoritarian streak. Trump for years, decades, has believed that he ought to be able to enforce whatever rough justice strikes his fancy based on his immediate reaction to something in the news. See: The Central Park Five. And now he's in a position where his lashing out in a tweet based on something he half-understood on the news has the power to shape international politics. And he's embracing it, leaning into it, doubling down on it. "Long before this guy has whatever he has." Trump resents the fact that he's being asked about something he tweeted, resents that he has to be the one to do something, and has completely lost the thread of what they were even talking about. Trump himself said earlier that he was soft on China, but he said he's soft the way he says he's sorry for not being politically correct or that he doesn't want to hurt someone's feelings. But when Schmidt suggests he was soft, he's got to swing back at that. Think about how many times Fred Christ Trump told young Donald that he was himself being "too soft" on Donald or Fred, Jr. Possibly while reaching for a belt. And here we come to one of the stranger lines: "It's not a tweet, it's social media." It absolutely was a tweet, but he doesn't like it when people think of him as "tweeting all day". He wants it to be seen as media, an alternative to the "fake news". Hamfisted branding. I think from the mention of his aides walking by that there may have been an internal discussion to try to eliminate the word "Tweet" and refer to it as "social media activity" or the like, and it popped into his head when he saw his handlers. Hence why he didn't correct sooner. Obligatory side note that he learned how many followers he has by hearing it on the news media that he doesn't trust. He could have looked at his own phone screen, but he wouldn't know it was real if it wasn't on the news. Everything that happens on Trump's watch is unprecedented. Entire continents have been stolen but there's never been a bigger rip-off than China selling us cheap consumer goods and parts, and selling bootleg Iron Man DVDs. "Hello, Joseph? It's your cousin, Marvin. Marvin Pulitzer! You know that bold frontier in speaking truth to power you were looking to reward? Well, listen to THIS!" 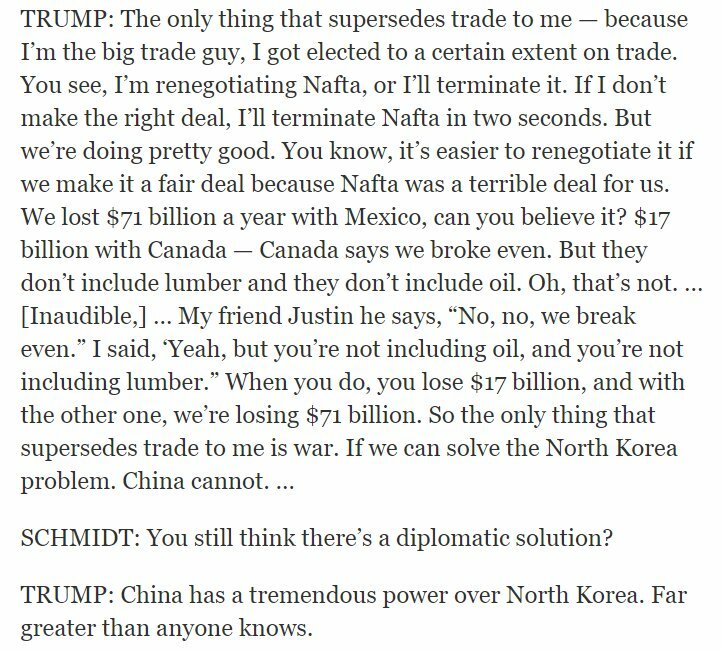 I'm old enough to remember when Trump was explaining how China has less power over North Korea than anybody knows. Seriously, after the Mar-a-Lago visit, Trump stood up and said that China cannot solve North Korea for us. "Not a lot of people know this", because it was news to him, but it was news he acknowledged at the time. Now he's undergone a hard reset. And that's the last bit of the transcript. I think the Times included it because they thought it was funny, but I'm not laughing at them and they've got a lot of egg on their faces this morning for the extent to which they humor and go along with him. I'm going to close this up with an observation, and that is his staff (including his communications director/minder Hope Hicks, and John Kelly) *know* that these interviews are disastrous and so never grant them, do everything they can to prevent them, etc. They happen because this man has all the powers of a multimillionaire and the so-called president of these benighted states, including full freedom of movement and the autonomy to sit down and start talking to whoever he wants to, about whatever he wants to. They happen because there is nobody on earth with the power to say "No, you are not going to do that." if they think something he's trying to do is a bad idea, whether it's talking to a reporter, shooting off a tweet, firing an investigator, or shooting off/firing other things. They can advise against courses of action. They can give him reasons not to do something. They can badger and browbeat. They can flatter and bribe (but again, short half-life). But they can't stop him from doing anything, while he holds the office. That's the biggest and scariest takeaway I see here. The greatest irony of all, however, could be how the newspaper that Trump loves to call "the failing New York Times" succeeded in delivering to him what he has long wanted: a clean shot at firing Jeff Sessions and Rod Rosenstein, and then installing a new AG to oversee Mueller. To make this more bizarre, Trump could rely for all this on the man he publicly called on to be fired and possibly prosecuted - former FBI Acting Director Andrew McCabe. 1.) Even before the wake of the revocation of Ex-CIA Director #JohnBrennan's Security Clearance, he has been very vocal against @realDonaldTrump. He seems to be in Full Panic Mode & concerned. 2.) According to @guardian news, GCHQ became aware as far back as late 2015 in regards to suspicious interactions between Trump associates & known or suspected Russian agents. As we have come to find out, 5 Eyes was involved in collecting this information. 3.) These 'alleged' conversations were picked up 'By Chance' 🙄 as part of routine Surveillance of Russian Intelligence assets. My 1st question is: Who are these Russian assets? Who was working with GCHQ or the FBI & had ties to the Trump team? I think we know who 1 of them is.